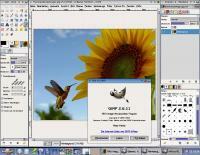 This is my second release of Gimp 2.6.11 for AmiCygnix. 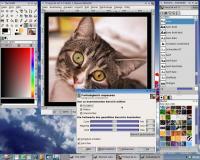 quality photo retouching program, an image format converter, etc. and extensions to do just about anything. * The promised keyboard support did not work. Fixed. * The menu shortcuts did not work. Also fixed. * A new splash picture in Amiga style. Thanks to Thomas Blatt! saving in JPEG, PNG or TIFF format you can choose now the compression rate. * Some of the Script-Fu scripts are now available as python plug-ins. * Compiled with GTK+ 2.24. * New version 2.7.2 of the Python package for Gimp python plug-ins. Greek keyboards) are now better supported. the installation of AmiCygnix 1.3 (or better) is mandatory! 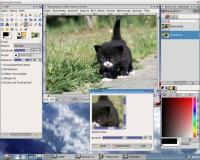 This version of Gimp contains several internal loader and saver formats. external loader plug-ins are missing. and more file formats are available. To reduce the size of this package, only some selected plug-ins are included. Additional plug-ins will be available in separate packages. do have a filesize of 14 - 15 MB because of this. * value-invert (menu item "<Image>/Colors/Value Invert"
Make the image look like it is printed on cloths. Requires: - "blur-gauss"       from "gimp-filters-1.lha"
Saves the image as colored XHTML text. Adds a layer of fog to the image. Offset the colors in a palette. Sort the colors in a palette. Create a repeating gradient using colors from the palette. Cuts an image along its guides, creates images and a HTML table snippet. Add a drop shadow to a layer, and optionally bevel it. Requires: - "blur-gauss" from "gimp-filters-1.lha"
Simple sphere with drop shadow. Distorts an image by whirling and pinching. Add a beveled border to an image. Add a border around an image. Add realistic looking coffee stains to the image. Requires: - "blur-gauss"      from "gimp-filters-1.lha"
Add a drop shadow to the selected region (or alpha). Add a jagged, fuzzy border to an image. Requires: - "blur-gauss"   from "gimp-filters-1.lha"
Add a guide at the position specified as a percentage of the image size. Add a guide at the orientation and position specified (in pixels). Remove all horizontal and vertical guides. Various functions to create a brush. Make an image look like an old photo. Paste the clipboard contents into a new brush. Paste the clipboard contents into a new pattern. Reverse the order of layers in the image. Round the corners of the current selection. Add a slide-film like frame, sprocket holes, and labels to an image. Gimp will be cancelled! They are deactivated by default because of this. Use them at your own risc! * External plug-ins are currently quite slow.